Spain’s Adri Arnaus fired a final round 69 to claim a wire-to-wire victory at the Challenge Tour Grand Final during an enthralling last day of the season which saw 15 players graduate to the European Tour. Arnaus had been in outstanding form all week at Al Hamra Golf Club in the United Arab Emirates, and, after rounds of 66, 69 and 67, started the last day with a three-shot lead as he went in search of a first Challenge Tour title. 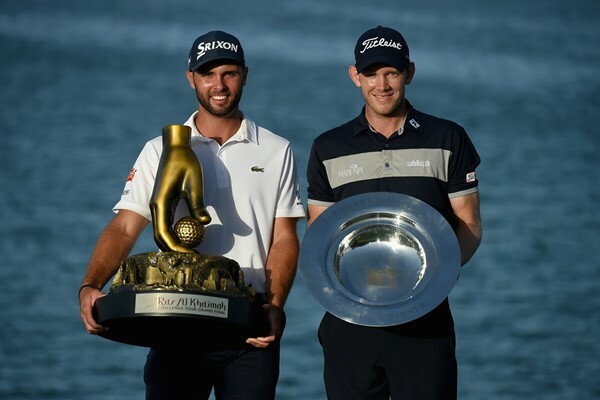 And it came right down to the wire, with the 24 year old from Barcelona needing to birdie the 72nd hole to claim a season-ending triumph – which he did by holing a four-foot putt to seal a one-stroke win over Frenchman Victor Perez. “Winning the tournament wire-to-wire is something that I have never done before at a professional level,” Arnaus said. “It is even more special because from the first day I was able to maintain the intensity and play some good golf, that makes this day even more memorable. “It is my first full year as a professional golfer and my main goal has always been to get to the European Tour, and to be able to do that in this way is just wonderful. Perez was looking to make it back-to-back victories after his Foshan Open win a fortnight ago – a move which would have dethroned Joachim Hansen at the top of the season-long ranking. Despite closing with a 67, Perez’s title charge ultimately fell short, leaving Hansen to become the first Dane since Thomas Bjørn in 1995 to top the money list. But the most captivating battle came for the final spot inside the coveted top 15. At the start of the week it was Tom Murray who held the final graduation position. His challenge ultimately fell away with a one over par 73 in the year’s final round. Contrastingly, Portugal’s Pedro Figueiredo, who started the week in 17th place, flew up the leaderboard by carding a closing 67 to push Murray outside of the top 15. The battle for the final card looked to have been won by Dutchman Daan Huizing, who needed to finish in solo second place to claim the last spot. The 28 year old held the position with two holes to play, but after three-putting for a costly double bogey on the 17th he was forced to settle for third place – handing Figueiredo the 15th and final European Tour card. Joachim Hansen; Adri Arnaus; Victor Perez; Kalle Samooja; Sebastian Soderberg; Jack Singh Brar; Grant Forrest; Kim Koivu; Stuart Manley; Liam Johnston; Sean Crocker; Robert Macintyre; Lorenzo Gagli; David Law; Pedro Figueiredo.